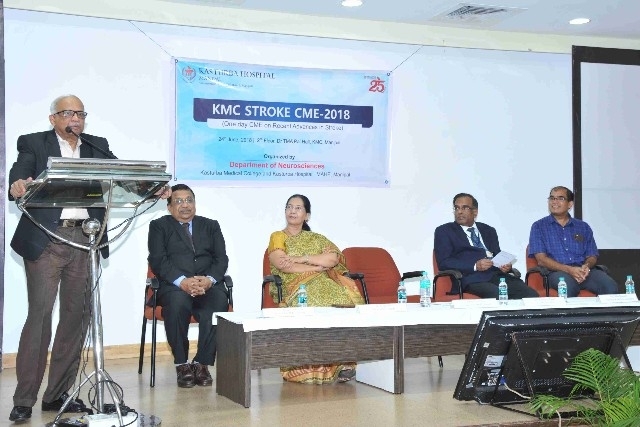 Manipal : National level Stroke CME was held on 24th June 2018 at Dr. TMA Pai Hall-2, KMC, Manipal. Recent concepts regarding Neuronal Plasticity / Stem Cell Research, Carotid Stenosis, Thrombolytic Therapy, Stroke Interventions & Mechanical Thrombectomy and Stroke Critical Care will be covered by eminent faculty from premier institutes and Indian Stroke Association. 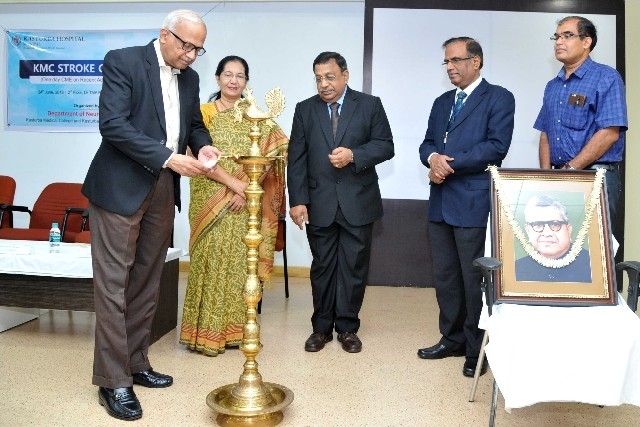 The Stroke CME 2018 was inaugurated by Dr. H. Vinod Bhat, Vice-Chancellor-MAHE, and Dr. Pragna Rao, Dean, was the guest of honour. This is being organised under the guidance of Chief Operating Officer Mr. C. G. Muthana and Medical Superintendent Dr. Avinash Shetty. 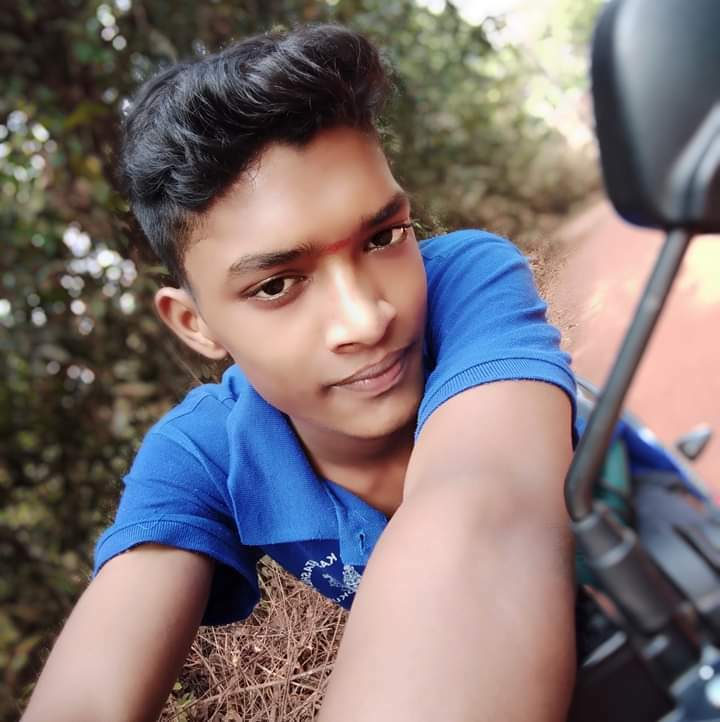 Brig (Dr) Shankar Prasad Gorthi HOD, Dept of Neurology Kasturba Hospital, Manipal said that Recent trend of research in stroke with stem cell implantation appears promising and may bring in therapeutic application in future. With the advancements, patient with episode of stroke could be treated upto 4.5hours using the intravenous thrombectomy for removal of blood clots or even upto 16 hours using the mechanical thrombectomy for removal of blood clots. Awareness level of the population is still very low and many occasion patient do not reach medical facility for treatment. The renowned stroke specialists and neurologists including Dr. Kameshwar Prasad (AIIMS), Dr. Sylaja P. N. (SCTIMST, Trivandrum), Dr. Dheeraj Khurana (PGI, Chandigarh), Dr. Jeyaraj Pandian (CMC, Ludhiana), Dr. Vinit Suri (Apollo Hospital, Delhi), Dr.Raviannadurai (AF Hospital, Bangalore), Dr. Raj Sreenivas (Artimis Hospital, Delhi), Dr. Anand Alurkar (Jehangir Hospital, Pune), Dr. Arvind Sharma (Zydus Hospital, Ahmedabad) were resource persons..